How to create users and employees in ClockIt and setup your account. You will be able to manage all users of your account from this page. By default, you will notice that one user with Admin role will be created at the time of sign up. The total count of active users is what will be considered at the time of billing. For example, you can have 100 users with just 3 active and you will fall under our NANO plan. To add a new employee, click on Add New. PRO TIP: To find an employee quickly, use the search box above the table. This table gives a quick glance at some of the important information for each user. For more info, click on the edit button from the Actions column on the right. This is the last column. Note: You might have to use the scroll bar or the keyboard arrow keys to see all columns. To view the employee profile, click on the Name and you will be redirected to the user profile. The device ID indicates the ID from the biometric device. If you are not using the biometric device this column can be ignored. The employee ID is the unique ID given to each employee as per your company policy. The site name refers to the site to which the employee belongs. The role is the group that the employee belongs to. It’s important to note that each group has its own set of permissions to different features in ClockIt. To review the permissions, go to company manage groups and permissions. As an admin, you will have access to all permissions in ClockIt. 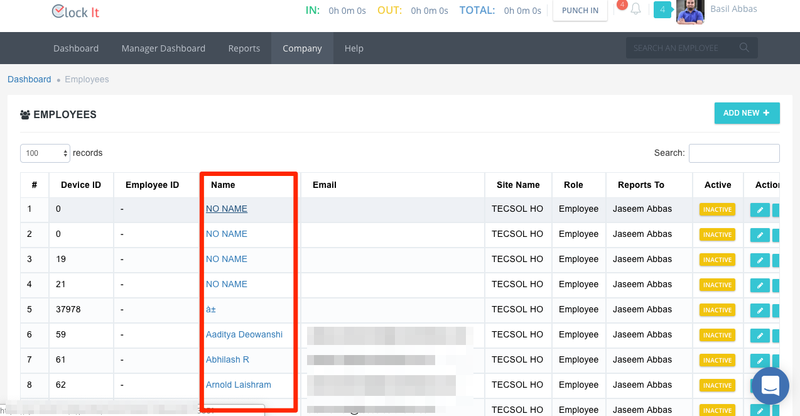 The reports to column shows who is the reporting manager for this user. To add a new employee, click on the add new button and fill the form with the following details. The Employee ID is the unique ID given to the employee as per your company policy. This is generally the ID that is printed on their badge. Enter the first name, last name and the designation. This data is only shown on the employee profile and you can also run custom reports. Select the gender for the user. This is updated in the user profile so that the user can be easily identified. 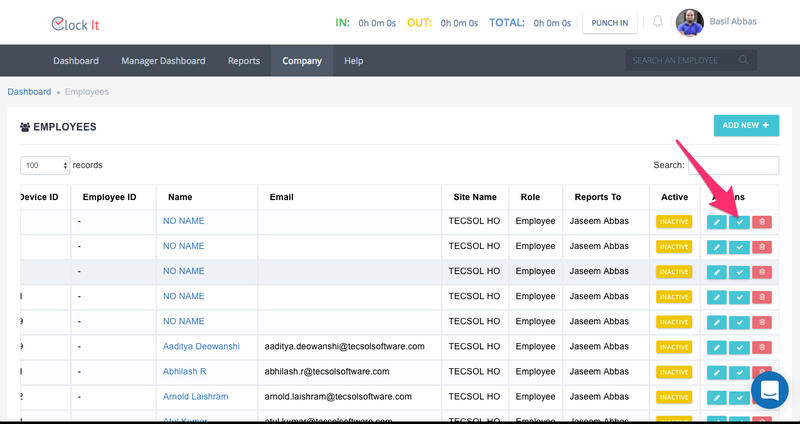 Tags are used to give multiple ways to find the user in reports. 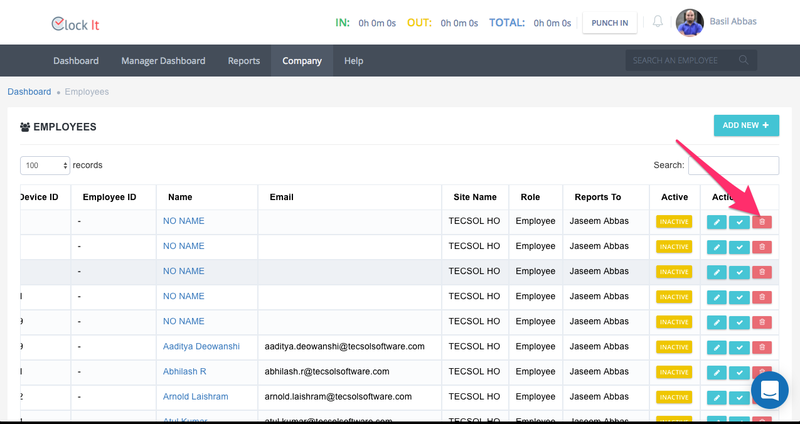 Tags will allow you to run custom reports in the dynamic reports and be a very powerful feature if used correctly. You can add multiple tags for a user. Tags will show up on the user profile. 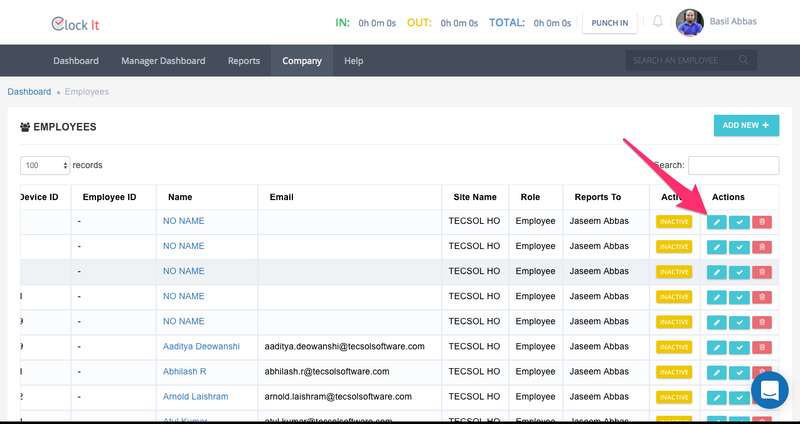 PRO TIP: If you use this feature to tag employees as contractors, you can generate reports for just all employees that are contractors. Enter the email for this user. This user will have to use this email address to access ClockIt. If you do not give an email address, then this user will not be able to access the portal. This is particularly useful when only using the biometric device. Important: If you are using ClockIt with Slack, ensure that the email address matches on both, ClockIt and the same email address are being used by this user in Slack. This is the password that the user will have to use in order to access ClockIt. To generate a random strong password, use the Auto Generate feature. Specify if you would like to send the login details to the user’s email address. Also, specify If you would want to allow this user to access the portal. A user may have the credentials to the portal but you can restrict his or her access. If you want to collect punches using the iPad Kiosk app and want your users to be authenticated with a PIN at the time punching, set this 4 digit pin here. Enter the joining date for the employee. This is the group that the employee belongs to. Each group has its own set of permissions that allows admins to give access to the various features in ClockIt. By default, ClockIt will have two groups created. The Admin Group and the Employee Group. You can change this even later depending on your needs. The reports to person is the manager that this user reports to. All leave requests, Business Travel requests and Correction Requests will be sent to this reporting manager. If this user does not have a reporting manager or does not report to anyone, you can check "This user does not report to anyone"
Select the site that this user belongs to. Every user can only belong to one site. You can have multiple sites, click here to know more. 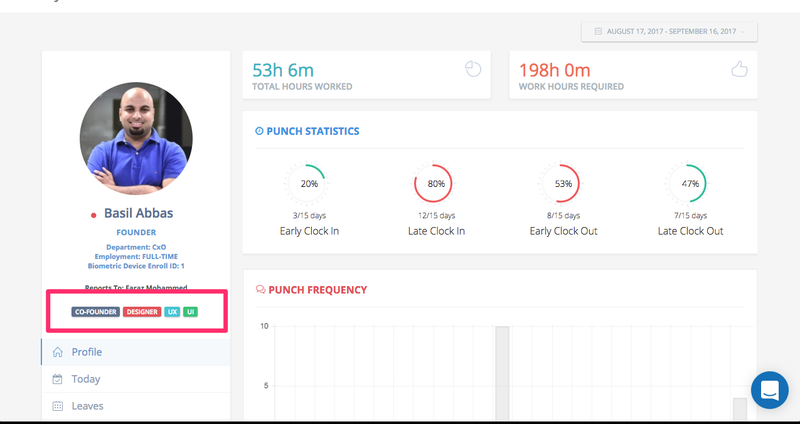 If you are using a biometric time and attendance device to manage your attendance and have added one to your site, this section will show. If you have connected your device to ClockIt, all users created the device will be synced with ClockIt and will appear in the Enroll Number drop-down. Know more about connecting biometric time and attendance devices to ClockIt. ClockIt supports punches coming from multiple devices. Meaning that employees can punch into one or more connected devices provided that they all have the same biometric ID. 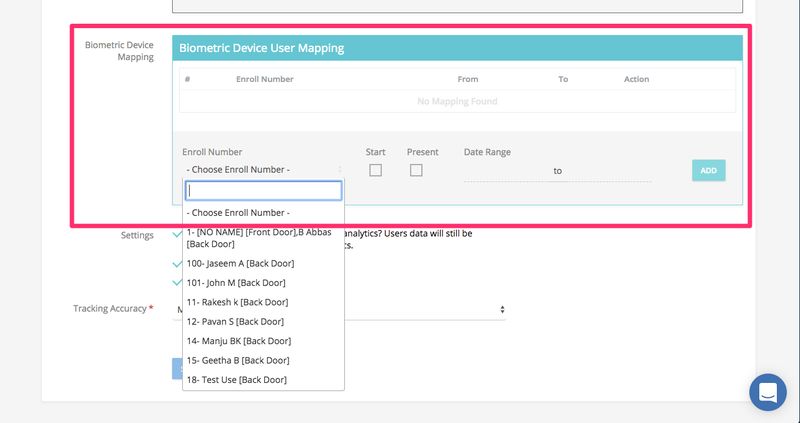 Since ClockIt supports punches coming from multiple devices, we follow a simple naming convention to make it simple to identify your users and the biometric devices that the users are created. If you add new users to the biometric device, these user ID's and Names will automatically sync with the Enroll ID dropdown after every 30 minutes. You can then assign a user to this mapping. Basil Abbas [Front Door] indicates the name saved in the first device and the device is saved in ClockIt as Front Door. [No Name] [Back Door] indicates the name saved in the second device and the device is saved as Back Door in ClockIt. Check this box if you need to gather all data from the date the user was created on the device. If you check this box, the FROM date will automatically be populated with the date from which data is first available for this enroll ID. Check this box if you need to make sure that all punches need to be saved against this user profile. If the present is checked, the TO date will automatically disabled. You may add as many biometric mapping as needed as long as they do not overlap with ID's that are already assigned to users for that date range. If this happens then ClockIt will throw an error. If you want to trace the user routes, then check “Enable GPS Tracking”. You will also need to specify the tracking accuracy. To edit a user, click on the yellow edit button on the right along the employee name. To delete a user, click on the red bin button on the right along the employee name. 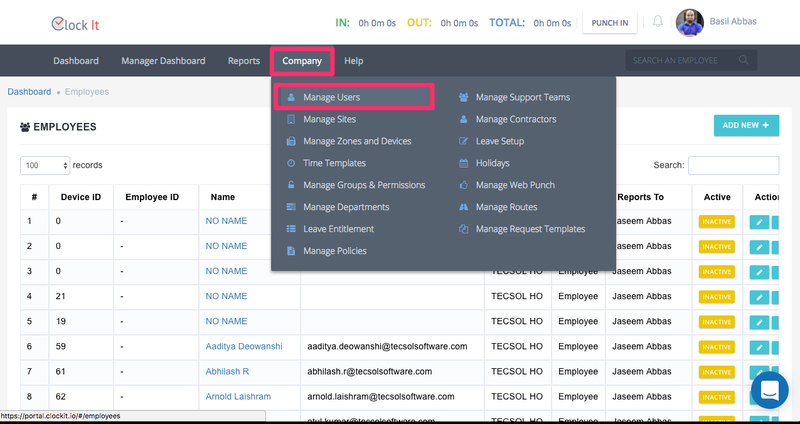 You can make an employee active or inactive by clicking the deactivated tick green button. An inactive employee is not counted towards the total user count. 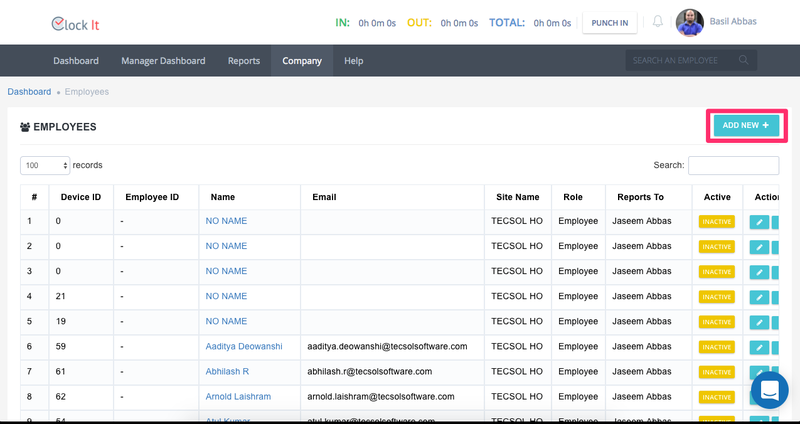 This allows you to retain data for your inactive employees. A deactivated employee will not be able to login into ClockIt. This permission will allow the deletion of users.